art: Jim Lee, Michael Turner, George Pérez, Joe Kubert, Adam Hughes, Greg Land, Frank Cho, Joe Linsner, Greg Horn, Walt Simonson, Doug Mahnke, Darick Robertson, Gary Frank, Sean Chen, Dale Keown, Bart Sears, Pat Lee, Art Adams, Jim Califiore, Phil Jimenez, Matt Haley, Tom Raney, Kevin Maguire and many, many more! * By tremendous popular demand, Wizard Entertainment proudly presents the newest edition of the BEST OF BASIC TRAINING! This special 120-page book is the third in this series and focuses more on the basics of drawing, along with more specific lessons on storytelling and more. 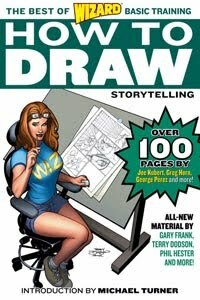 Read more of the best and most instructional “HOW TO DRAW” lessons from Wizard: The Comics Magazine’s 15-year history, along with a brand new set of unpublished lessons from some of the biggest names in comic art. LEARN FROM THE GREATEST ARTIST IN COMICS! * Kubert, Wieringo, Breyfogle, Dodson, Calafiore, Raney, Hanna, Risso, Horn, Jimenez, Bendis, Perez, Simonson, Hester, Hitch and many more. OVER 25 ART LESSONS ON STORYTELLING & CRAFTING YOUR COMICS! * Fundamentals of Storytelling, Storytelling, Laying Out a Page, Panel Layout, Dramatic Tension, Pacing, Evolution of a Page, Silhouettes, Splash Page, Negative Space, Shadows, Backgrounds, Settings, Script Pages, Group Shots, Sound Effects and much more! Breathtaking design sketches Bryan Hitch, Mike Wieringo, Terry Dodson and more! DESIGNED FOR BOTH THE ASPIRING ARTIST AND INTERESTED FAN!